Time to do the "Thriller Dance"
I've been reading Shelby Foote's The Civil War trilogy which is excellent. 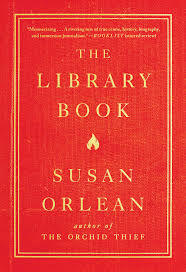 My only regret is that I wish he had recorded the audio book; I love his voice. As I was reading over the weekend, and with Halloween looming, I did a little research on Halloween during the Civil War period. There's a really interesting article here, by Caroline Davis. 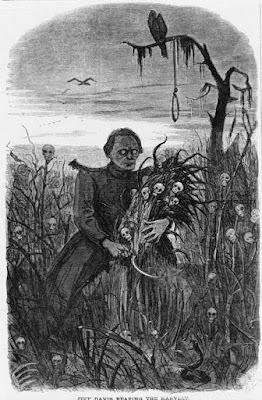 She notes a couple of images that suggest a spooky, autumnal theme to her: one of Jefferson Davis reaping skulls, and Ohio born politician, and Southern sympathizer, Clement L. Vallandigham, as a pumpkin. Poor Jefferson Davis looks a little like a character in Michael Jackson's Thriller, doesn't he? Terrible! I'm not sure if those images were meant to evoke Halloween or just Fall and harvest time, but they certainly can be perceived as spooky. Certainly the soldiers didn't have time to worry about Halloween! Blogger Thomas Ruys Smith notes the same two images on his blog and makes the association of pumpkins and Halloween and records its publication date as October 31, 1863. In truth, Halloween wasn't even a holiday back then and if anyone was aware of the date at all it would simply have been All Hallows Eve, the day before All Saints Day and unless you were Catholic you probably wouldn't have even thought about it. You can find a fairly complete history of Halloween in America here. Another history can be found here, and yet another here. Have a happy Halloween, do the Thriller dance, and grab some candy! Steve and I have election fatigue We are sick of it all. I am, anyway. It's gone on too long and I've been sick of the Clintons for decades. This has been one of the most absurd, most unpredictable, most irrational elections that I can ever remember. I don't have a good feeling about it at all. Not one bit. So the weather was gorgeous yesterday and although it still feels like summer, it was nice to stand in that forty-five minute line, visit with neighbors, and make some new friends as we all waiting to exercise our American right to vote. The line was literally a block long, extending all the way to the Hallmark store and reports are that earlier in the week it wrapped around onto Texas Street. We didn't care. We got in line. This really got me: there was an older gentleman wearing a face mask and his wife behind us. We visited a little, talking about the proposed Amendments mostly, and the man stepped out of line to sit in one of the folding chairs placed along the line. "He's got Stage Four lymphoma," she said. "That's why he's wearing that mask. He was supposed to have surgery Friday but his platelets were to low." 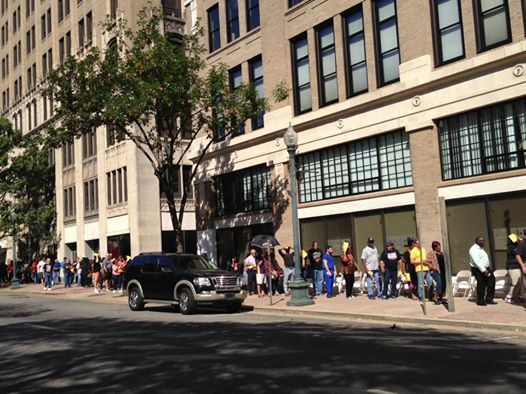 It took no time at all for us to expedite these people to the front of the line. I am so filled with love for this man who is so ill and so obviously felt terrible and all he wanted to do was vote. God bless him! We also met a very nice couple in front of us and before we reached the end of the line we determined our Six Degrees of Separation: she grew up in my neighborhood and her mother was my kindergarten teacher. She had her mother's absentee ballot in her purse. She invited us to a Veterans Day concert at her church and we plan to go! I was so busy visiting that I forgot to keep up with my Pokemon game - I was in the absolute middle of Pokestop heaven - with Gastlys and Haunters everywhere. 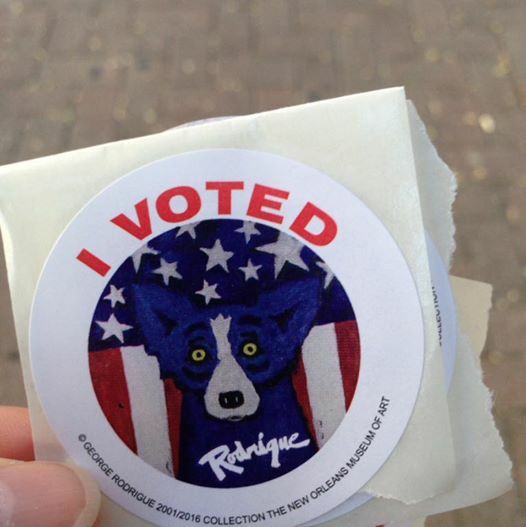 We voted, I got my Blue Dog sticker, and we walked down to Blind Tiger to eat. (They still do not have onion rings or any other craft beer besides Great Raft - shameful; support local beer!). 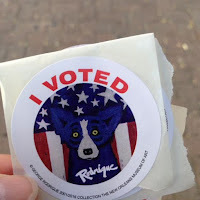 After we ate we walked the length of Texas Street to the church so I could work the Pokestops and I noted that the voting line was still just as long as when we were in it; it was equally as long on our return trip back down the street later. I am pretty confident as to how Louisiana is going to vote in the presidential race, but we have several other local races and a senate race that are all very important. Translation: Should there be standards for registrars and transparency in the hiring process? We need a constitutional amendment for that? One of the great things about Shreveport/Bossier area is our love of art and our support of the arts. Another great thing is our love of history and our support of the many individuals, organizations and groups who both preserve and work to spread knowledge about our history. Shreveport/Bossier has a fascinating history and many, many interesting characters have passed through our area. The Caddo Parish Courthouse is in itself a work of art with a fascinating history. Standing in front of the courthouse is a monument that is a true work of art and which is ignored by probably ninety-percent of the people who pass by. 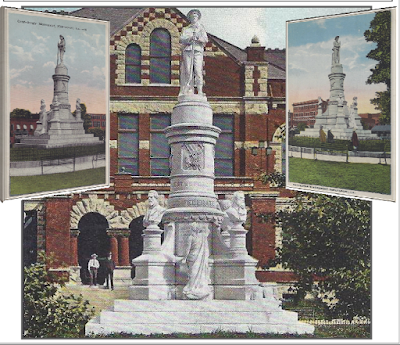 Frank Teich, a Texas sculptor, created the Caddo Parish Confederate monument which was dedicated in 1906 before a crowd of thousands of residents and dignitaries. It's a stunning work of art and my favorite part is the classical beauty, Clio. Clio is the Muse of History who stands at the base of the monument in all of her classical beauty, holding a scroll in her left hand and with her right she is pointing to a memory book for the war dead. 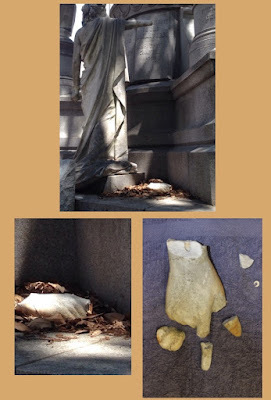 As it turns out, Clio's arm was broken this past summer by a trespassing trumpet player who climbed over the decorative fence that encloses the monument, and then climbed the base of the monument. scaling his way up, he grabbed Clio's outstretched arm for support, and sat on a ridge just above her head to play his instrument. He rested his leg on her arm, and the arm shattered. Just a few weeks after that, a vandal armed with paint filled balloons approached the monument in the dark of night, his face covered by a hood, and threw the balloons, thus dashing the monument with red paint and causing thousands of dollars in damage. The photos below show some of the paint damage but trust me when I tell you it is much worse in person. 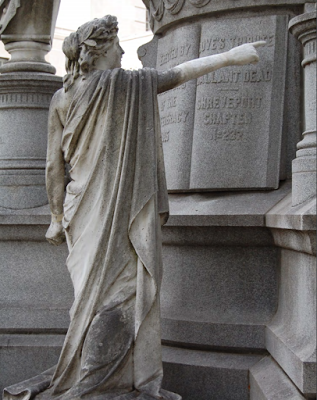 The artist, Mr. Teich has several other monuments in the city, including work at Greenwood Cemetery. 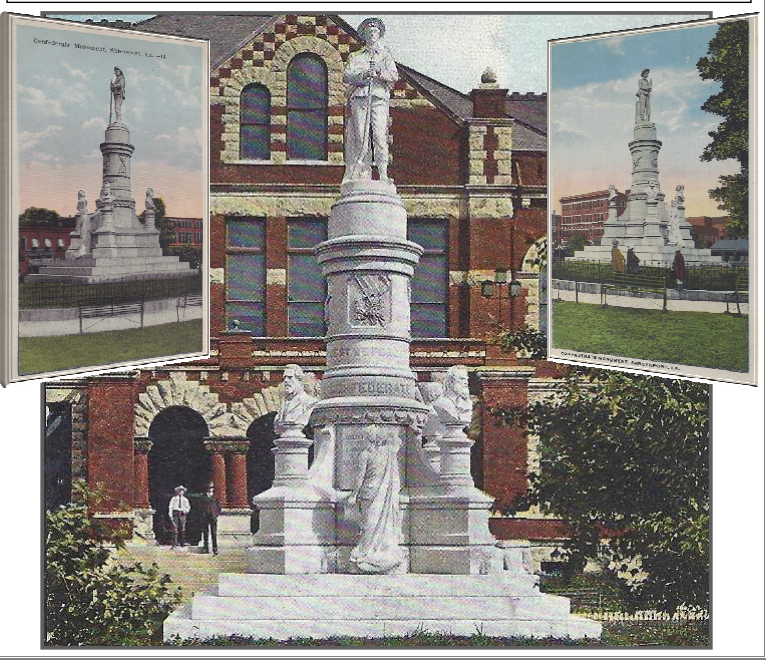 It is a 30-foot tall granite and marble centaph depicting not just Clio, but also a lone soldier at the top of the column, and four busts of four Confederate generals. While Confederate monuments are present in many towns across the South, ours is unique in its beauty and composition. There is not another one like it. It was placed on the National Register of Historic Places in 2013. 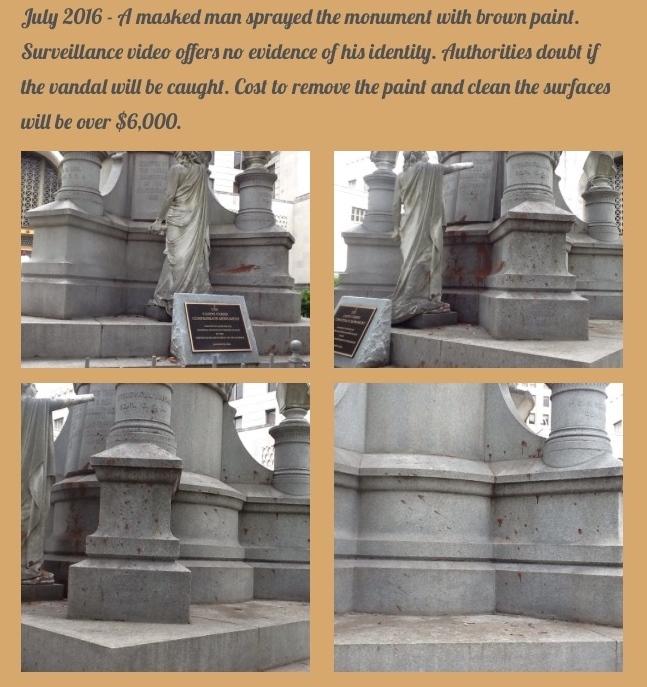 The monument now needs our help. The Shreveport Chapter of the United Daughters of the Confederacy has obtained two estimates from reputable restoration experts to repair Clio and to remove the paint. It isn't as easy as going to Home Depot, getting chemical, and a water hose. The estimates are both very close and both very expensive. The UDC is raising money to restore this monument. The estimates are in stages - one is to repair the hand, another for the paint removal and that includes overall cleaning from the pollutants that are eating away at the stone. We need to raise $6,000. That's a lot of money and the UDC does not have it. The UDC is a non-profit group that gives its money to charities, so writing a $6,000 check is out of the question. Your help is needed. No amount is too small. And those end of the year tax deductions are coming up! Please share this post on Facebook and via email; I'm hoping a wonderful philanthropist will see our need and help save this priceless work of art in our city. The hint of fall in the air Saturday lured people outside in great numbers this weekend. While most people headed downtown to the Red River Revel, Steve and I went south, to the Mansfield State Historic Site, to hear a presentation by Dr. Cheryl White of LSUS who was speaking on ghosts and folklore around the Civil War battle site in Mansfield and the surrounding area. Dr. White said the same thing Steve Smith said a few weeks ago when we did his walking tour of downtown: basically, if you talk about ghosts, people will come. Smith told us that evening, "Do you think if I just said we're going to do a walking tour of downtown that people would come?" Nope. But if you throw in a few ghost stories, you get a crowd. Dr. White had a standing room only crowd yesterday. Her presentation was brief; about thirty minutes. Dr. White recounted the basic history of the battle, and told of a few ghostly encounters people have had while walking the Mouton trail at the battle park. The thing that she said that sticks with me that I found really interesting is that she said she had a conversation with a colleague about spirits one time. This colleague is an astrophysicist who explained it this way. She said you can't separate time from space. "Think of it as transparencies on an overhead projector," she said. You lay one transparency down over another, over another, over another...you can get glimpses of the one on the bottom, the one that was there first, but there are these other images on top of it. Basically, we are occupying the same same space as those soldiers on that battlefield that April day in 1864. Are they still here? She explained it more eloquently, and it's interesting to think about in those terms. After the presentation the audience had questions, which she addressed, and then Steve and I toured the museum and grounds. It's been several years since I've been out there, something that I regret. The place is a real treasure and I'm interesting in visiting more often. Here is one of the most beautiful pieces in the museum: The Rose Mantle that stood in the White House through several early presidencies until renovations demanded a different color scheme. The museum itself is arranged chronologically; when you enter, go clockwise through the room, following the information panels and display cases which take you through time. There are also displays in the center of the room; this one illustrating hospital conditions. I am fascinated with the shelves of books and documents in the presentation room; how wonderful it would be if this museum also functioned as a library and research center (and it may - I didn't ask). I envision this room filled with large library tables for scholars to research and learn on the very site of this most definitive battle. I can see students of history examining books, diaries, letters, maps, periodicals of the time...simply fascinating. After Dr. White's presentation, Steve and I took advantage of the beautiful afternoon to walk the grounds. They do a wonderful job here in community education and in presenting many ongoing programs. Recently the site hosted a program on baseball during the Civil War era (sadly we missed it) and each April there is a reenactment of the battle which draws thousands of people. As you enter the park, the monuments are on the right. There are four: the Polignac Monument, the Colonel Beard Monument, the Captain Field Monument, and a monument placed in honor of General Taylor's victory at Mansfield. There is also a marker for the park itself placed by the Kate Beard Chapter 397 of the United Daughters of the Confederacy. As you walk the trails behind the museum, there are text markers to guide you. Be sure to pick up a paper copy of the text of these markers in the museum before you begin your walk; the sun has damaged some of them rendering them unreadable, so the paper copy is quite useful. Be sure to get a paper guide! There is also a nature trail with markers along the way for various trees that are growing along the way. Is Dr. White right? Are there voices whispering through these pine trees? Note the rise in the landscape: that slope that basically hid the Confederate forces from Union soldiers; as Union soldiers marched up that slope they suddenly became visible. The Union soldiers knew the Confederates were there because there had been skirmishes, but imagine their surprise at the numbers of Confederates as they approached the crest of that slope, rendering visible their opponents. Hwy 175 is on the left; the visitor's center on the right. The monuments are on the other side of this hill. It's hard to get a sense of that unless you're actually walking that hill, but if Dr. White is correct and there are still "voices" there, I can hear them at that moment. Here are a couple of good maps of the battle. Here is the Facebook page for the Mansfield State Historic Site. Follow their page to keep up with upcoming programs. On October 29 the site will host their 23rd Annual 'Ghosts of the Past' tour with a tour of the battlefield conducted by authentically costumed guides who will act out various scenes along the trail. This program begins at 7:30 p.m.
Fall is a wonderful time of year to visit the park; the trees and grounds are beautiful and the air crisp with the promise of fall. Take a trip!